About: There’s so many children’s books I like, love, even adore. But then there’s the ones I really love. I mean – really fall in love with. And I know these books because they’re the ones that make me turn a nice limey shade of green. Sigh. I wish I’d written this book. I love it so much. I love eccentric characters. Recently, a librarian I admire made a presentation and commented that the greatest storytelling books often include an eccentric character. How true. And Miss Llewellyn-Jones fits the bill. Riding her pistachio moped to town, teddy-in-basket (just wait – every child you read to will say “Look at the teddy!”), with her red helmet on and a flounce of golden curls peeking out, kids will delight at Miss Llewellyn-Jones riding up hill, up hill, up hill and doooooooown, with her spotted bloomers peeking out of her billowing skirt. What child – or adult, for that matter – doesn’t love the charms or a whimsical, childlike adult? As Miss Llewellyn-Jones collects her wares from the proprietors in town – sausages, bread, lollipops (in lieu of cupcakes), persimmons, gooseberries and freshly squeezed cumquat juice – teddy, who becomes a tad bored – slips from his basket crammed with goodies and wanders away. 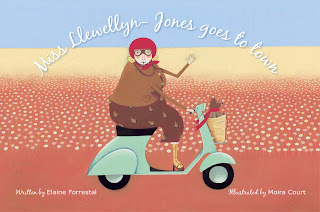 Can Miss Llewellyn-Jones find dear teddy or will he tumble into a post box and be sent away to forever? This book has a charming and perfect balance of prose and illustration that form a tight marriage both illustrator and author must be proud of. The beauty and rhythm of the storyline and pictures truly make it a keeper to stash away in the glory box for your kids' kids. 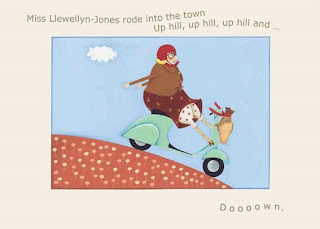 Both children and adults will adore scooting along with Miss Llewellyn-Jones and teddy, and I, for one, am keen to see where their daily adentures take them next. Read an interview with illustrator Moira Court here.